Russian instrument and presents | Daily Life in Japan, Muravej Co.
An instruction started today of the new Russian instrument I had chosen. It seems to be a good one. In the evening, I taught English to some students in the institute. 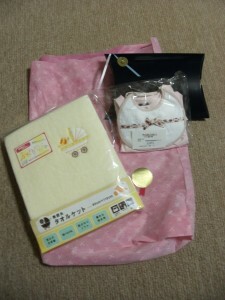 After the lesson, they gave presents to Mariya; a towel and clothes. I passed them to Katya. Towels are always useful for a baby. This entry was posted in Daily life, Katya, Mariya, Science and Technology, teaching and tagged English, institute, instrument, Katya, Mariya, Russian, student. Bookmark the permalink.